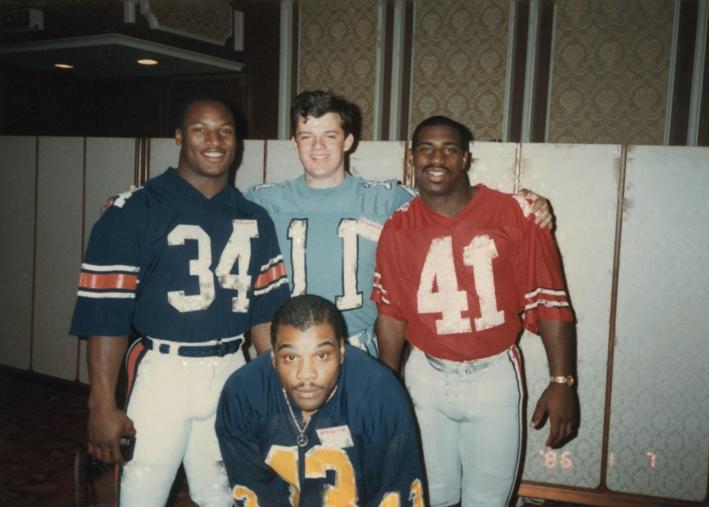 The last time Bo Jackson played football in an Auburn uniform—or at least in an Auburn helmet—wasn’t for the Tigers, but for the East team in the 1986 Japan Bowl. His 171 yards and three touchdowns, including the game winner, a 57-yard run in the 4th quarter, was enough to beat the West team (31-14), earn him MVP honors, set a Japan Bowl rushing record (previously 85 yards), and land the cover of the program for 1987 game (is that Ed King behind him? )… that as far as Auburn-related programs go, has got to be pretty rare. 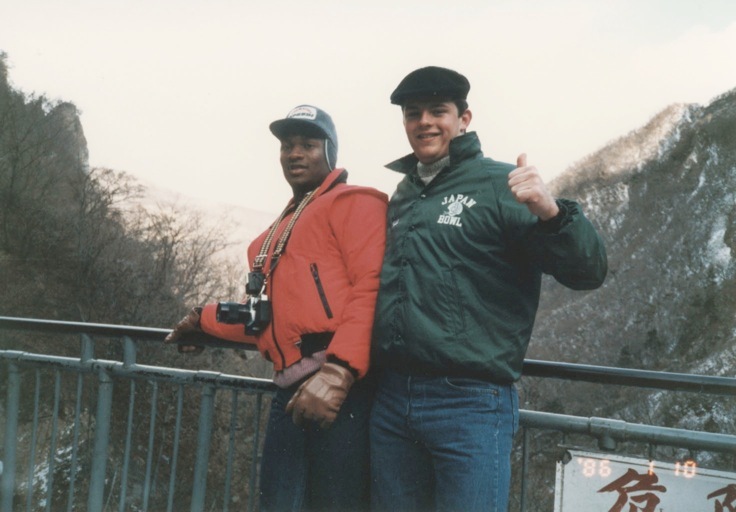 A quick Google search yielded other rare records of Bo’s visit to the land of the rising sun: Snapshots of Bo the tourist taken with a camera belonging to Columbia kicker and on-sides specialist Larry Walsh, who represented the Ivy League in that year’s Japan Bowl. UPDATE: Bo and his biggest fan in Japan. Proud sponsor of the Heisman Trophy indeed, Nissan. 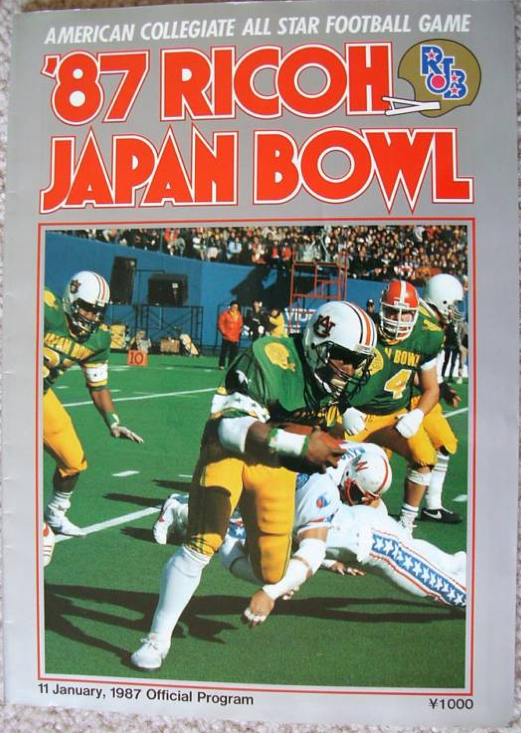 Japan Bowl cover via @owensco79; photos via. The AU player behind Bo was probably Ed West or Steve Wallace. Those guys were all-star material themselves. (King was a little later). For some reason I thought it was called the Mirage Bowl. My husband was the travel coordinator for the Japan Bowl. We have countless photos of at least 6 or 7 Bowl games – each with a Heisman Trophy winner featured. I have a football signed by Bo Jackson for that year’s Japan Bowl game. Thinking of placing it on sale on Ebay? Forgot to add that Bo was very popular with the Japanese. Not only his reputation and skills, but his dignity, was well respected.